Coolers have a special place in my heart, and indeed the hearts of so many outdoor enthusiasts regardless of your preferred activity, be it camping with the kids, fishing, and kayaking or simply heading to the park with a frisbee and the dog. But to do all these activities you need the best cooler for the money, to keep your stash of beers and juice cold. Of course, during all of those activities, we need to stay well fed and hydrated and a cooler allows us to get away from it all whilst still having the luxury of our very own mini-fridge no matter where we are. Getting lost in the wilderness is usually something to fear…but give me a great cooler and place me back in nature and I’m all for it! In this article, we take a look at the 6 best coolers for the money and we review each one in turn so you can choose the one that suits your needs. Coolers are measured in Quart size, or often by the number of cans they can hold. If you’re a beer drinker then the latter will be important to you since it’s hard to gauge just how big 52-Quartz is…but tell me a cooler can fit over 80 cans and now I have something to work with! Handles, wheels, and weight all come into play here. If your cooler is destined for the back of your vehicle and is not likely to be carried far then a good set of handles will suffice. If, however, you plan on using your cooler on the back f your canoe or kayak, then you will want something that’s the right size so that you don’t overshoot your weight capacity and send your balance on the water off, but also something that can be lashed down if need be. On the other hand, if you’re looking for a cooler for the beach or park for example, then a good set of wheels will do the trick, since walking on sand is hard enough without having to balance a cooler between 2-people! A name synonymous with camping and the outdoors, and also very popular for their wide range of coolers. Coleman has been around for a long time and they are a brand that is both trusted to build quality products at reasonable prices. Which is why this is the first on our list of cooler reviews today. 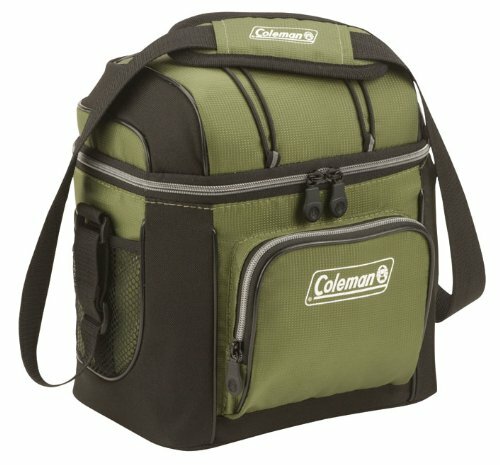 The Coleman 54-Quart Steel-Belted Cooler can hold up to 85 cans of your favorite beverage, has Stainless-steel handles which have a soft touch rubber grip to help when carrying. When it comes to the outdoors, we love simple and indestructible, like a Japanese SUV. 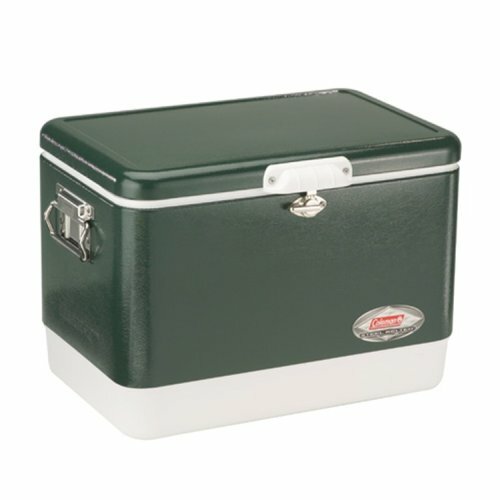 This is exactly what you get with the Coleman 54-Quart Steel Cooler. Whilst heavier than some of the other coolers featured here, it is perfect for a family day or weekend out or a fishing trip with the buddies. You won’t have to worry about bashing this thing about, it can take it thanks to its spill free capabilities. It’s also rust-proof too, so any water splashes or sudden downpours won’t damage your beloved cooler! Igloo should be a name you also recognize since it is reported that almost 3 in 4 US households own an Igloo cooler. How crazy is that? 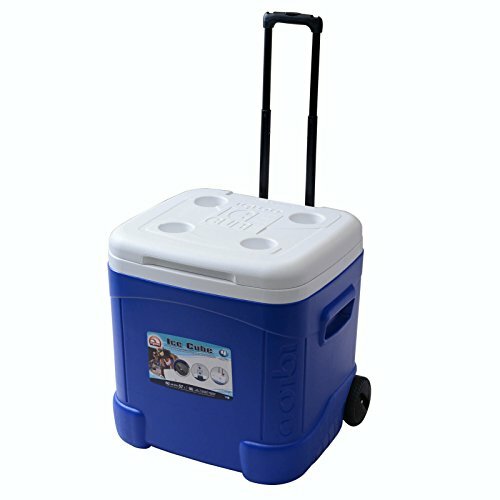 The ‘Ice Cube Roller’ is a 60-Quart monster of a cooler, with some unique features that make this a bit of an all-rounder. First up is the extendable handle which is designed to adjust to your ideal height and make pushing and pulling the cooler easy. This goes hand-in-hand with the two wheels which allow you to transport the cooler longer distances without feeling like a pack mule! My only complaint with this cooler is the color, Ocean Blue. It seems every cooler out there is the same cooler and I get it, Blue = cool (temperature) but I much prefer a good choice of colors. Luckily I prefer functionality over style and the Igloo gets a thumbs up on all fronts. With the telescopic handle and robust wheels and also the two side carry handles, there really is nothing that would stop me buying this cooler. Oh and if you need closely you will see the 4x cup holders that are cleverly molded into the lid to hold your drink…now that’s what I’m talking about! 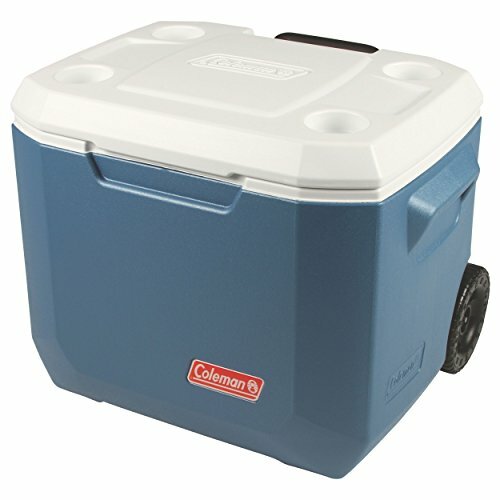 Another entry now from Coleman, which is no surprise since this is an article looking at the best coolers for the money. With a swinging handle to easily maneuver your goodies and a 60-can capacity pug Ice, you can really fit a lot into this 50-Quart cooler. We love the 7″ all-terrain wheels on this Coleman Cooler, which are true off-roaders. Sand, grass, dirt you name it, it’s going with you no matter what. Since the cooler is made from Polyethylene, it is also rustproof and with the stay-put lid which operates on a hinge, it is also leak-proof. This cooler will last you for years to come and makes it one of the best coolers for the money. Ok, you may be thinking ‘not another Coleman’ but hear me out on this one. This cooler gets it’s spot on the top 6 list because it’s designed specifically for marine activity and I know a lot of our readers love their watersports. So if you’re a keen boater, into kayaking or canoeing then this cooler will do the trick. Its size makes it suited to use with some for of transport, be it a boat or other water vessel or your vehicle. Ok, here’s why this cooler rocks. First up we’ve got the largest capacity of any cooler on this list, 120-Quartz and it can hold 204 cans…if that’s not selling it to you I don’t know what will! 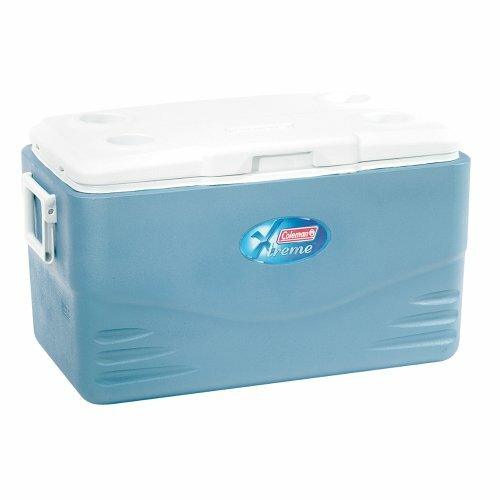 This cooler is capable of multi-day trips and will keep the ice solid for up to 6 days in temperatures up to 32 °C (90 °F). Meaning you can take extended trips and plan your adventures, safe in the knowledge that your food and drink will be fresh when you need it. However, the killer feature for us is the Have-A-Seat Lid which allows you to sit and rest on the cooler which saves you having to bring along a camping chair. The cooler can support up to 250 lbs in weight and also contains 4 molded cup/can holders so no more knocking over your beer! 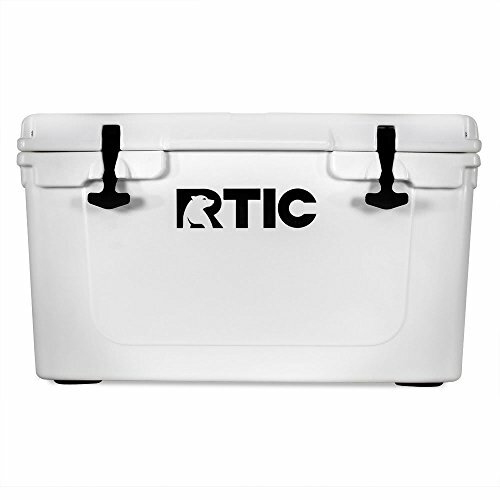 The RTIC 45-Quart Cooler makes a bold statement. 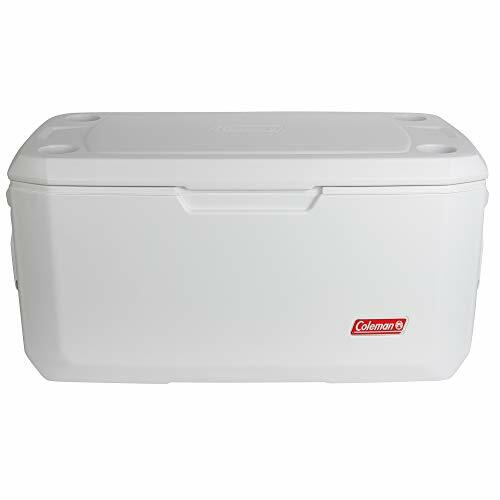 This is a cooler that can keep your ice fresh for up to 10-days. That’s longer than any cooler on this list and makes this the cooler that keeps its ice the longest. Inside of the lid is a tough rubber seal which is pressed firmly into place by the heavy duty T-latches. Despite having a reduced can capacity, the RTIC does come in a 65-Quart size also, so if you’re looking for something with a little more capacity then that’s what I’d go for. The RTIC 45 however, is built to last and suits those taking multi-day trips be it Fishing, Boating or hunting. The build quality and length of time this cooler can keep your food and drink fresh are the stand out qualities you should look for in a cooler. Something for the day-tripper now who is looking for an ice cooler suited to carrying over distance or to a picnic spot with ease.This soft cooler is made designed to be soft and flexible making carrying comfortable and convenient. With mesh side pockets for bottle openers, knives and forks etc, a zippered front pocket and a 16-Can capacity this is something a little different than the others featured on this list. This is just like carrying a small backpack or handbag for the ladies. I’ve personally got 2 of these for picnic and days out with the kids. They are perfect for carrying sandwiches and drinks and other goodies to keep you going throughout the day. I’ve even taken this on my paddle board which was lashed to the front and carries my water and a light snack! Families and those looking to take multi-day trips into the backcountry. Even those looking for a cooler to throw into the back of their car and take off, you can load up your favorite foods and snacks and hit the road for days and your food will be fresh and ice cold. Thos looking for portability over rough terrains such as sand or rocks. This product doesn’t have wheels and is designed to be carried only a short distance or inside of a Canoe or Kayak for example. I hope that our article Best Cooler for the Money showed you which cooler is the best for you. The best piece of advice I can give is to think how you will be using the cooler and the number of people it will serve. From there you can narrow down your search to a select few and read the online reviews for each before deciding.